In the recent weeks, we were contacted by Tracy, whose son was just about to turn fifteen, and she asked us to provide a Hog Roast for his birthday party that would take place at a local, outdoor paintball facility. Jonathan, the birthday boy had tried one of our famous Hog Roasts at one of his friend’s parties last year, and ever since that day, he knew that he wanted the same at his own birthday, and Tracy, lovingly obliged. 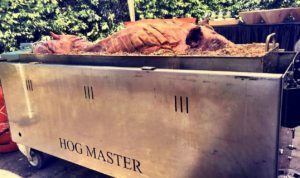 It was an early start for the team at Hog Roast Braintree, who needed to be at the paintball facility by eight in the morning in order to make the twelve o’clock serve time. Tracy had invited thirty of Jonathan’s friends from school, and wanted to feed them with our famous pigs in buns, as well as a dessert. While the chef butchered the hog and laid it on the spit to roast, our catering assistants set up the gazebo and serving tables. Tracy also wanted to make sure Jonathan and his friends were well fed before playing, and so she also asked us to prepare some sausage and bacon sandwiches when they arrived in the morning. The guests arrived fresh faced and excited at nine o’clock, and not long after they were fed, they were shipped off to the their first battle. For each of the games, the guests were split into two groups and then given an objective to either attack or defend a particular item of worth, like a flag in the game Capture the Flag. When they returned for lunch the guests were covered in paint, showing each other their bruises from where they’d been shot, but despite the pain, they all beamed with excitement. The team at Hog Roast Braintree served the mighty hog in our crusty bread rolls with a selection of sauces, and the guests queued patiently. In the afternoon there were more games to be played, and at the end of it all the guests were treated to a dessert – handmade individual cheesecakes, one for each brave soldier. When the day was done the team at Hog Roast Braintree tidied away discreetly disposing of any waste off site. Tracy thanked us for helping to make her son’s birthday a special one.